Grease Monkey is a creation of Exotic Genetix. It is known for delicious flavors and a cool body warmth like a comfortable blanket. Growing outdoors in a sunny environment, it can yield 21 ounces per plant. Grease Monkey marijuana can be grown inside, such as in a grow room, a tent, or a greenhouse. Indoors, Grease Monkey will yield 18 ounces per square meter. Flowering time Grease Monkey buds will flower indoors in 8 – 9 weeks. Grease Monkey weed plants will be ready for harvesting outside in the of the month October in the United States. It can stand up against viruses, molds, mildews, bacteria, and fungus. 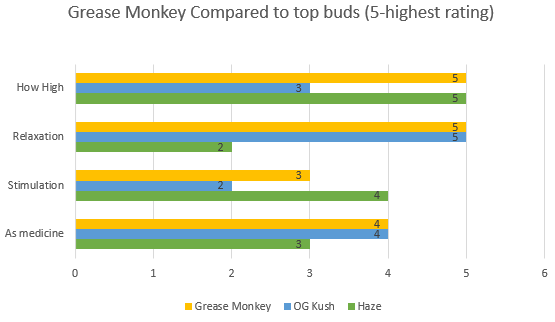 Grease Monkey cannabis plants have strong disease resistance. Grease Monkey cannabis plants will grow to a medium height, between 30 and 80 inches tall. Grease Monkey Strain can cause dry mouth, dry eye, and symptoms of panic in high doses. This plant will require a medium level of skill to be able to bring to a fruitful harvest. 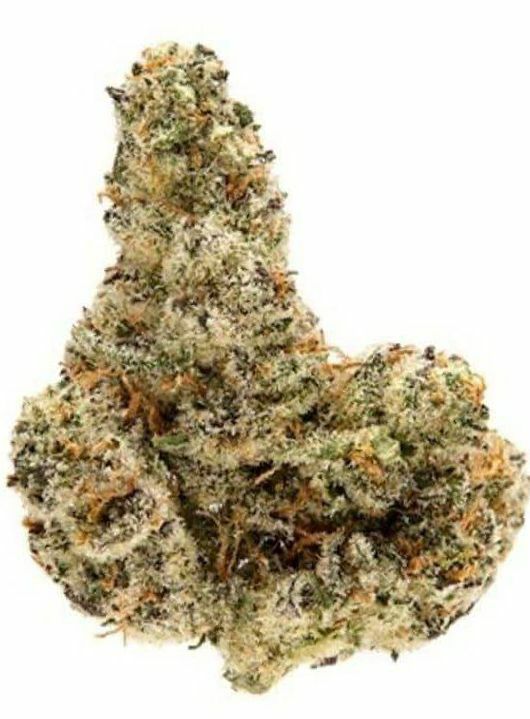 Grease Monkey will create a powerful high and both stimulating and relaxing effects. Grease Monkey is the flavorful offspring of the powerful Gorilla Glue #4 and the delicious Cookies and Cream. It is the creation of the breeders at Exotic Genetics. The started with a seed store in Tacoma Washington and through diligent research and experimentation, elevated their game to Cannabis Cup status. Grease Monkey’s buds have an Indica shape, medium and compact. The flower head is like a long cone. The leaves are a medium green color, encircled with mesmerizing orange pistils. Buds are coated in frosty, sticky trichomes. Your Grease Monkey cannabis strain will reach a medium height, between 30 and 80 inches tall. Grease Monkey is a veritable bouquet of smells. There is earthiness, ‘gasolina’, sweetness, even cookies. It mixes the sweetness Cookies and Cream with the punch of a chemical diesel that goes straight to the head. That smell gives you a preview of the relaxing and mildy stimulating effects. Growing weed from Grease Monkey cannabis seeds or cuttings requires a medium growing ability. Few of the secrets to growing this novel strain are available to the public but we can extrapolate from our personal sources as well as the growth pattern of the parents, Gorilla Glue # 4 and Cookies and Cream. You can grow this strain indoors or outdoors. Indoors, you can experiment with a tent set up with reflective lining to bounce the light back onto the hungry leaves. You can use five gallon buckets filled with organic soil and nutrients. Or, you can use a hydroponic set up with your own mix of growth medium and nutrients. When your plants sprout up, make sure those lamps are focused on your hungry leaves so that they get maximum exposure to the light. You need to keep the air dry so that mildew and bacteria don’t build up on your precious plants and you don’t have to fill the environment with toxic pesticides. Your soil needs to maintain the right moisture level. You can keep the air clean and moving using a fan and exhaust system to move the air through. A filter can catch all the nasty stuff and you can dispose of it. In nine weeks, your plants will be ready to flower. Then it will be time to trim your stems into bundles and hang them for drying, curing, and storing. You can store in typical mason jars (darkened to keep out nutrient-robbing light) or you can use a complex system like CVaults and a Cannador. These specialty products will maintain the proper moisture level so that your weed lasts a long time. You can come away with a yield of 18 ounces per meter squared of growing space you have used to plant your weed. Outdoors, you wanna mimic that warm, dry, sunny Cali climate. The Ocean Grown (OG) climate. You don’t really have to have that kinda fine, expensive real estate, just find a place that gets a lot of sunlight and has good, dry air, and away from pests. You can use a mix of organic fertilizer like Flower Power and organic soil. Your Grease Monkey weed buds will flower in the middle of the month of October. You can come away with 21 ounces for each weed tree. Grease Monkey is a 50 percent Sativa and 50 percent Indica with up to 30 percent THC. 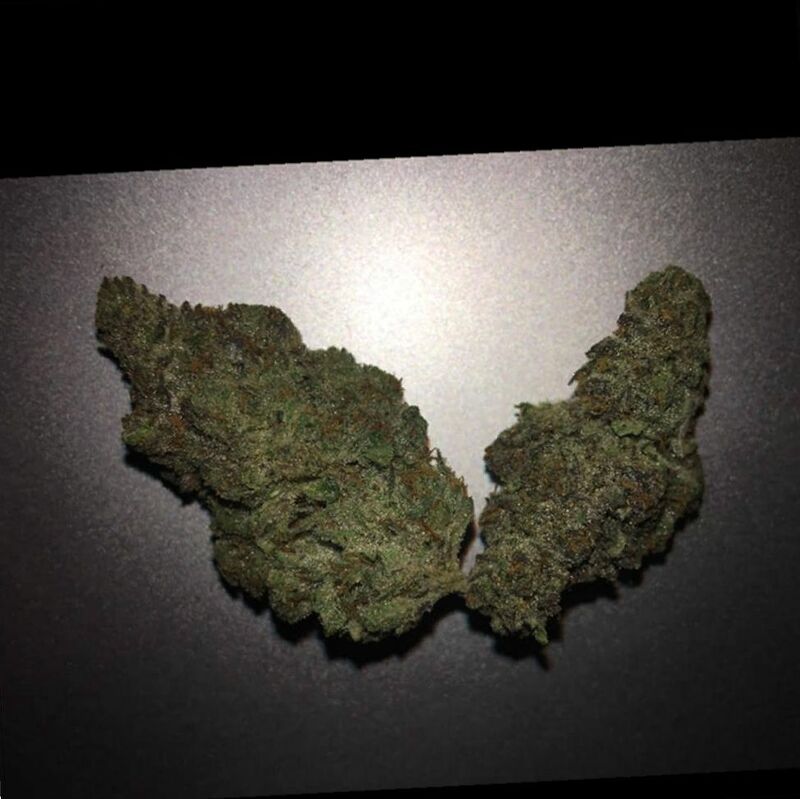 That’s a mad punch of weed, some of the highest levels available. Sufferers of many disorders have found this to be a great boon. It may be particularly useful in Inflammatory Bowel Disease. A 2017 article in the Journal of Pediatric Gastroenterology and Nutrition considered the rationale for the possible use of cannabis in children with Inflammatory Bowel Disease and the legal barriers that obstruct research (Hoffenberg, Newman and Collins). A review on sciencedirect.com reviewed the studies on cannabis use in Inflammatory Bowel Disease and concludes there is good evidence that medical marijuana treatments can be effective and that more research is warranted (A. Lahat). An earlier study in 2012, published in Digestion, a cannabis spray preparation improved quality of life and patients with Inflammatory Bowel Syndrome also increased in body mass index, since this condition causes dangerous weight loss, this is a positive outcome (Lahat, Lang and Ben-Horin). With THC levels up to 30 %, be ready to blast off into space. 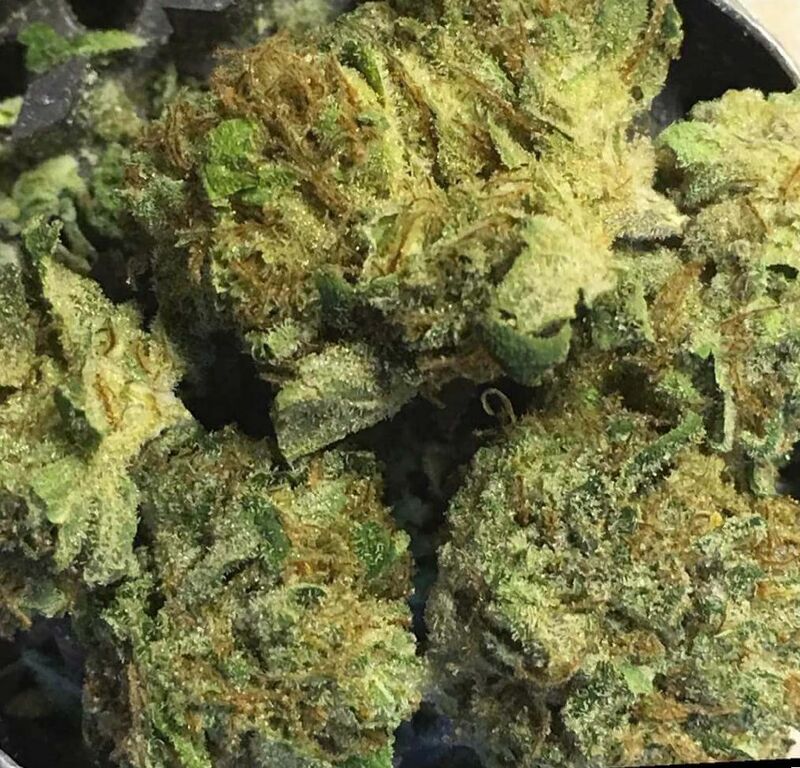 This strain is gonna give you a strong body high, sprinkled with a stimulation in the brain that makes it fun and euphoric at the same time. 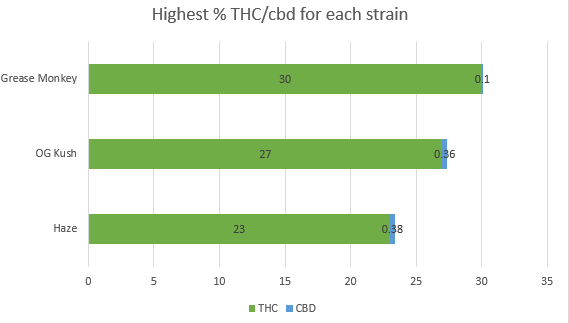 If you get one of the brands that have the highest THC levels, you will need only a few tokes. You will be hit by strong earthiness, gasoline to get your engines revving up, and hints of grape. Each taste is a phytonutrient which has its own effects. Some of them help stimulate creativity, other’s provide euphoria, and pain relief. They moderate the effects of THC so that your high comes out just perfectly, full of warmth, relaxation, mental stimulation, and euphoria. Hoffenberg, Edward J., и др. «Cannabis and Pediatric Inflammatory Bowel Disease: Change Blossoms a Mile High.» Journal of Pediatric Gastroenterology and Nutrition 64.2 (2017): 265-271. 14 3 2019 г. https://ncbi.nlm.nih.gov/pubmed/27579692. Lahat, A. Medical Cannabis for the Treatment of Inflammatory Bowel Disease. 2017. 14 3 2019 г. https://sciencedirect.com/science/article/pii/b9780128007563001113. Lahat, Adi, Alon Lang и Shomron Ben-Horin. «Impact of Cannabis Treatment on the Quality of Life, Weight and Clinical Disease Activity in Inflammatory Bowel Disease Patients: A Pilot Prospective Study.» Digestion 85.1 (2012): 1-8. 14 3 2019 г. https://ncbi.nlm.nih.gov/pubmed/22095142. Naftali, Timna, и др. «Cannabis for Inflammatory Bowel Disease.» Digestive Diseases 32.4 (2014): 468-474. 14 3 2019 г. https://karger.com/article/abstract/358155.